Samjyor Lama is originally from Humla, a remote mountain district of Nepal. He excelled throughout his schooling and completed his Bachelor degree in Management in 2014 from Tribhuvan University. He is currently working toward an M.A. in Social Science. 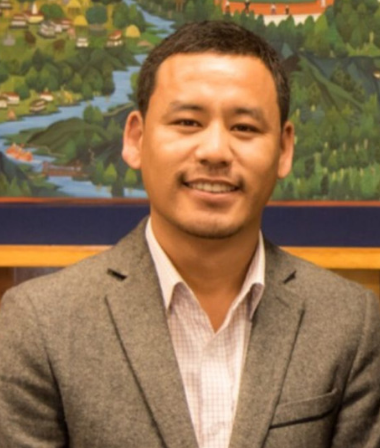 In 2009, Samjyor started his career in child protection as a field assistant at the Nepali NGO, The Himalayan Innovative Society (THIS). THIS works for underprivileged children in the Karnali region of Nepal and is NGN’s local implementing partner. As an experienced Reintegration Officer, Samjyor was involved in reconnecting and reunifying over 400 trafficked and displaced children in Nepal under NGN projects. In addition, he worked to reunite trafficked children with their families when he was a social worker for The Umbrella Foundation in 2011. In 2012, Samjyor joined Next Generation Nepal as a Program Officer where he led NGN’s reintegration and youth scholarship projects for a year. In 2014, Samjyor became Project Director of NGN’s partner organization, THIS, to oversee NGN’s projects in Nepal. He also worked as a technical advisor for NGN on the drafting of the NGN-THIS’ “Reintegration Guidelines for Trafficked and Displaced Children,” which was launched in 2015. In 2016, Samjyor became NGN’s first Nepalese Country Director. Samjyor has been leading NGN’s anti-trafficking projects in Nepal since 2016. Samjyor represented both NGN and the at-risk children of Nepal at a prestigious European Union Anti-trafficking Roundtable in Brussels. Throughout his career, Samjyor has worked in different capacities on behalf of children in Nepal—from serving as a junior field officer to holding a senior management position. Samjyor carries a wealth of knowledge and experience in the area of child protection, youth empowerment, and non-profit project management. Samjyor comes from one of the remotest and mountainous areas of Nepal. He visits his village whenever possible and takes time to trek and explore new places in Nepal. His passion is to protect and provide for his people and country.